INDIANAPOLIS, Ind. — College students using the miracle of modern technology to reach out to professors and potential employers may be doing more harm than good, according to a professor at Indiana University. Never use email or text for important, delicate or questionable communication. It's better not to have a written history of these discussions. Email and texting are efficient and convenient, but drawbacks include potential misinterpretation of the message or a negative reaction from the recipient, according to Jim Parham, who teaches journalism classes at IU. “Somewhere in the e-revolution, we found that short-form messages, delivered electronically, are an adequate replacement for face-to-face interaction,” states Parham. Email “wars”, endless strings of communique and unrepentant language can make a bad situation worse, according to Parham. Many employers have switched to electronic applications on their Web sites for both job applicants and internships. Unfortunately, this company-centric process eliminates the human interaction, thereby negating any interpersonal skill strength a candidate may possess. Write emails and text with the same care and specificity of a hard-copy document. Use full sentences and proper grammar. Construct your email as you would any written correspondence, with a beginning, middle and end. 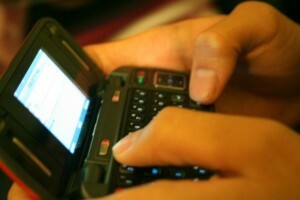 Determine if an email or text is a proper way to communicate with another party. Understand that colleges and universities retain most student emails in their databases, keeping a record of your informal banter. Take the easy route on an internship or job hunt by simply “applying online.” Press hard and find a warm body willing to talk. Use popular online abbreviations and electronic shorthand. The recipient may have no idea what you mean. Use email or text for important, delicate or questionable communication. It’s much better not to have a written history of these discussions. Rely on email as your sole source of social and business interaction. Human interaction and telephone calls can help you gauge another person’s demeanor and viewpoint much more accurately.